Kanban stock squares are usually used in kanban applications where inventory or stock items are stored on the factory floor and take up a designated space such as a pallet of product or Work in progress. Using the pallet example, a kanban square area can be drawn on the factory floor where the inventory will sit.This type of system can also be integrated with a FIFO system and is also a 5s solution as it provides a designated place for that particular item. The kanaban stock square system can be used with a set safety stock level (Fig 1-A) or without one (Fig 1-B). With a safety stock level the squares can be painted either a combination of two colors (usually green and red), red meaning re-order. 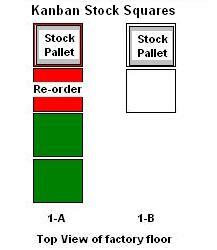 A re-order label can also be placed on the first red square after the last green square. This first red square will be the re-order or replenishment signal. Without a safety stock level the kanaban squares can be painted on the ground but not necessarily painted a certain color. The re-order signal is the fully empty kanban square(s).